Forward engineering enables you to create a script of your database model. You may export a script to alter an existing database or create a new database. 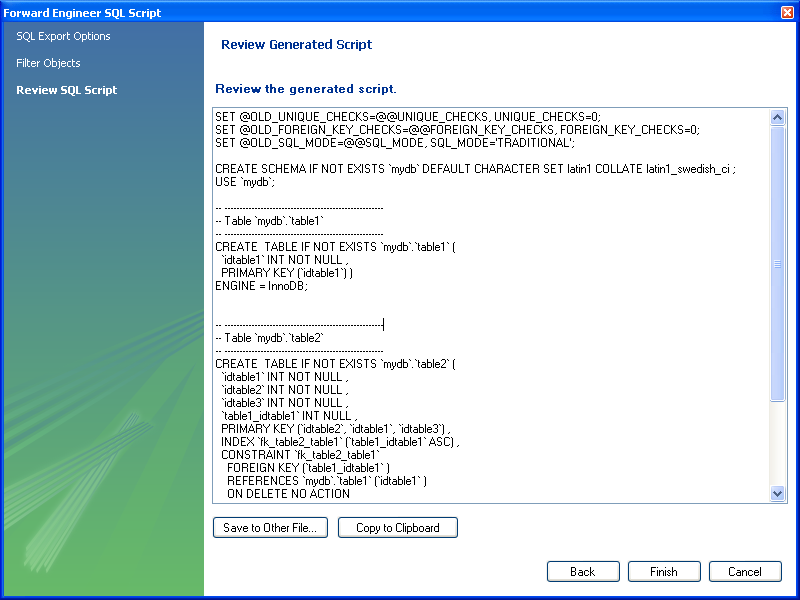 The script to create a database is similar to the one created using the mysqldump db_name command. Choosing to create a database yields additional options. With the MySQL Model (model-name.mwb) tab open, click File, Export, and then Forward Engineer SQL CREATE Script to start the Forward Engineer SQL Script wizard. The following figure shows the first page of the wizard. To specify the output file name, enter it into the Output SQL Script File field, or use the Browse button to select a file. Leave this field blank to view, but not save, the generated output. Select this option to generate a statement to drop each object before the statement that creates it. This ensures that any existing instance of each object is removed when the output is executed. When this option is unchecked, tables are sorted according to foreign-key references. 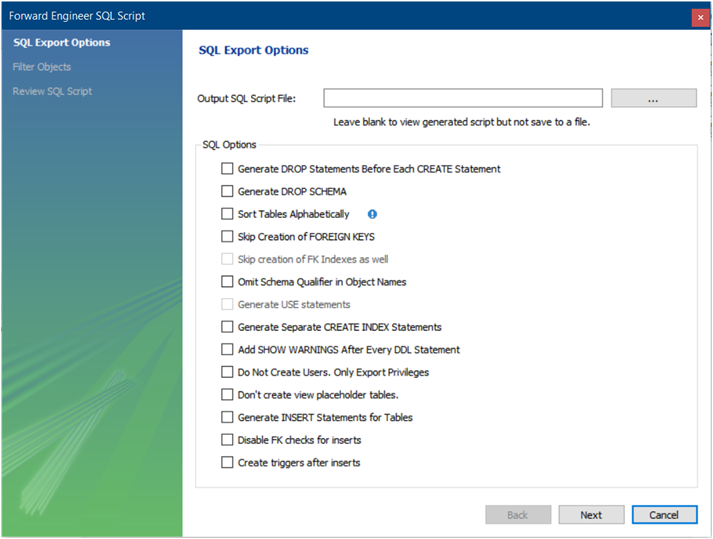 Select this option to generate unqualified object names in SQL statements. Select this option to create separate statements for index creation instead of including index definitions in CREATE TABLE statements. Select this option to add SHOW WARNINGS statements to the output. This causes display of any warnings generated when the output is executed, which can be useful for debugging. Select this option to update the privileges of existing users, as opposed to creating new users. Exporting privileges for nonexistent users will result in errors when you execute the CREATE script. Exporting users that already exist will also result in an error. Select this option if you have added any rows to a table. For more information about inserting rows, see Section 8.1.1, “SQL Query Tab”. 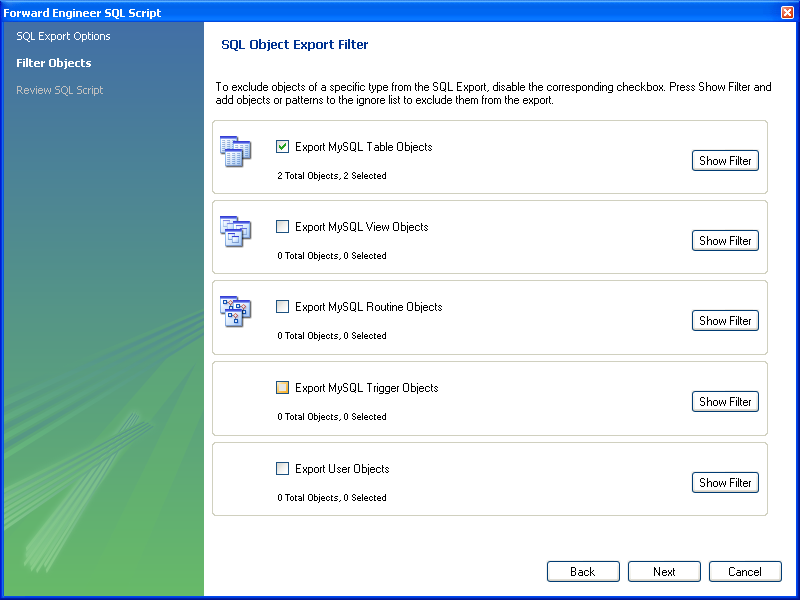 Clicking Next opens the SQL Object Export Filter page (see the figure that follows), which enables you to select the objects for export. Use Show Filter to fine tune (filter) the objects for export. After selecting the objects to export, click Hide Filter to hide the filter panel. After selecting the objects to export, click Next to review the generated script. The following figure shows an example script to review. You may return to the previous page using the Back button. The Finish button saves the script file and exits. You can then use the saved script to create a database. The menu item for creating an ALTER Script File is Database, Synchronize With Any Source. Typically, this option is used when the SQL script of a database has been imported into MySQL Workbench and changed, and then you want to create a script that can be executed against the database to alter it to reflect the adjusted model. For instructions on importing a DDL script, see Section 9.4.2.1, “Reverse Engineering Using a Create Script”. 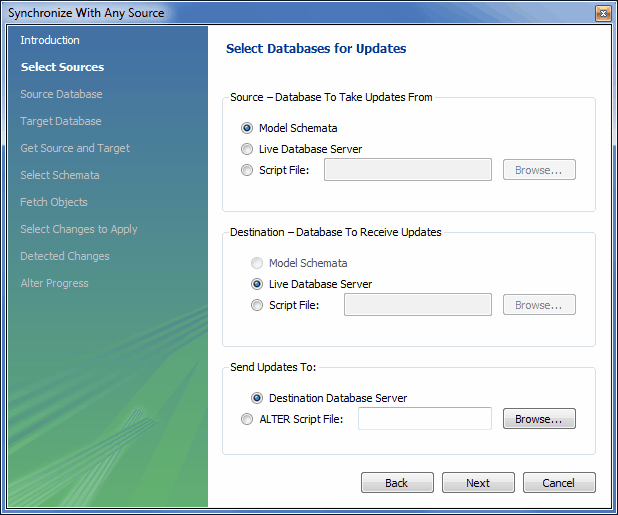 Select the Database, Synchronize With Any Source menu item to start the wizard. You will be presented with the first page showing the introduction and then the available options for setting the source and destinations of the updates. For additional information, see Section 9.5.1, “Database Synchronization”.